I am not particularly a huge fan of Ricky Ponting. May be it was his goatee in the 90’s, his being a dead ringer for Dubya, or the general abrasive attitude, but I have always been thoroughly impressed with his professionalism. It was Eden Gardens, March 2001. 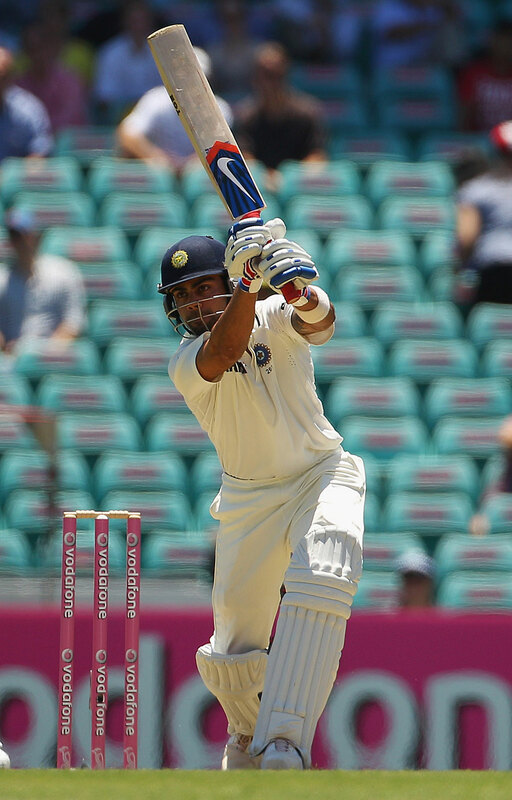 VVS Laxman and Rahul Dravid had mounted the most unlikely of comebacks on a day of 374 runs without getting out. The partnership was over 350 when Michael Slater was on to bowl as the Australians were run ragged by the duo. Laxman played a pull to the square leg area. The ball was headed to the boundary and one can see the fine leg fielder give up the chase but not Ponting. He chased the ball from the deep midwicket position, put in a full-blooded, headlong dive – in vain. (Watch the clip. 09:25). I was impressed by his professionalism, a total commitment to the cause. I saw a similar thing unfold recently, but this time I was at the ground to witness it. Sydney 2012. Michael Clarke and Mike Hussey in the midst of an unbeaten 300+ run partnership that had put the match beyond India’s reach, with the score at 653/4. It was the 3rd delivery of the 159th over. Hussey pulled a short ball from Umesh Yadav. Running full tilt from the fine leg boundary was Kohli, sliding to pull the ball back from a certain boundary, in the process saving two runs that proved to be pointless in the larger scheme of the match. As hopeless as the situation was for India, it warmed my heart to see a youngster still stay true to the course and display the kind of professionalism that we desire to see in all of us. An average of 21.27 runs per innings after 6 tests does not make for pretty reading for any newcomer to the International test scene, especially if you were anointed the future of a cricket mad nation, but that is exactly where Virat Kohli stands. A young man of just 23, he has been in the eyes of the world for the better part of 5 years from his days as the captain of a U-19 world cup winning squad to being poster boy for bad behavior and also as the only retained player of an IPL franchise that let legends and big names go. It has been a tough introduction to test cricket for Kohli, with Fidel Edwards having his number in the West Indies with accurate, fast, short pitched bowling, and now in Australia, though he looked attractive in Sydney, has not had much to write home about. The current Indian batting lineup is stuck in neutral and it looks like Kohli might be made the fall guy, and that would be very unfair on the young man. With names too big to be dropped, this Indian line up is neither building for the future nor is it succeeding with the current lot. There is a groundswell of opinion to blood Rohit Sharma – rightly so – but it shouldn’t come at the cost of Kohli. It is quite obvious that Kohli has the talent to make it on the grandest of stages but be is yet to do justice to his immense abilities at the test level. However, the manner in which he batted his way on to the Indian World Cup squad after having gone through a lean patch provides for much hope. His mature innings in the quarterfinal against Australia and in the final against Sri Lanka are testament to the fact he can absorb pressure in the biggest matches and perform admirably. With the retirements of Dravid, Laxman and Sachin Tendulkar destined for the future not too far, the Indian team once again has to learn to win together and will go through some growing pains. It is going to take players of immense character and commitment to tide through this period, if Indian cricket once again has to rise to the mountaintop. Kohli is one such player and needs to be persisted with. His commitment to his team’s cause is a well-known story when he showed up to bat on and save his Ranji team the day after his father passed away. The selectors and the team management need to be bold in their thinking about India’s future and not pussyfoot around the tough decisions that need to be made. If they indeed decide to drop someone from the lineup that lost by an innings at Sydney, it has to be one of the elder gentlemen and not the face of the future. This entry was posted in India and tagged India, India v Australia 2011-12, Virat Kohli. Bookmark the permalink. I swear I’ve read praise of Ponting’s fielding in that same Test somewhere else. Also, Kohli’s QF was brief, ending abruptly with a very stupid shot but admiration for his knock in final is justified. That he was retained by RCB was purely a business decision, credit to him for sorting out his priorities and performing well through 2010 and 2011, it’s a shame his CLT20 knocks don’t get the praise they deserve. For someone who underwent a phenomenal change in his approach to the game so early in his career, I felt he would turn up ready to play Tests. So I’m sad to see his indecisive batting, his soft dismissals. Really thought he was doing a good job, fighting it out to see Ind through to a win at Wankhede but again fell to a poor shot and you know what happened there. And now the pressure shows in his batting, totally opposed to his calm in ODIs and that’s just an invitation for the bowlers. It’s good that he gives his all even after a day in the field, it’d be better if he does the same for a few hours when he’s batting. @crownish – Yes, It was the change in his approach to his batting and life in general off the pitch in the recent past is what gives me hope that this young man can turn things around for himself in the test arena as well. Sure, he has shown slight discomfort and some self-doubt but he is gifted, talented, has solid temperament and has shown the ability to adapt to the demands of the game. So there is much hope from him, still.